I haven't done a random food adventure in a while. Usually, more often than not, the experience will end up being disappointing. I wasn't really trying to do so today; but on my way to Kyoto Sushi on 72nd, I had to turn onto a side street to make a U-turn of sorts. 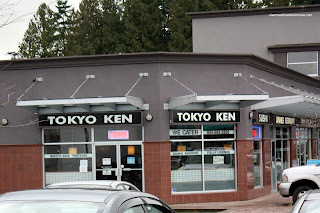 While doing so, in some random strip mall, I noticed another Japanese restaurant called Tokyo Ken. It looked busy and there was plenty of parking, so I figured why not? When I first walked in, I took the table right at the entrance. But it wasn't really a great spot since it was quite cold every time someone opened the door. Furthermore, I was right out in the open for everyone to see my mad picture taking. I ended up moving to the back of the restaurant, hidden from the staff. Somehow, I'm a bit more brazen when dining in a group; but not necessarily alone. Originally, I was considering ordering a la carte; but noticed that the bento boxes seemed to have everything I wanted to try. Thus, I selected Dinner Box C which consists of 5pc sashimi, dynamite roll, ebi sunomono, miso soup, green salad, chicken teriyaki and tempura for $13.99. As expected, the sunomono and soup came quickly. I was pretty happy with the sunomono, it was very vinegary and sugary while the cellophane noodles had some bite. The miso soup was alright, I just wish there was some wakame. Now, after I quickly scoffed that down, it was relatively long wait for the box. Not a horrible wait; yet a bit too long for someone needing to eat lunch quickly and leave. 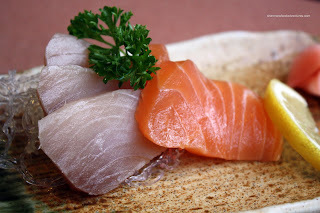 Arriving on a separate plate, the sashimi was not very good. Both the tuna and salmon were quite mushy and bland. However, the most disappointing item must've been the teriyaki chicken. I don't think I've seen a piece of chicken that thin before. This resulted in the chicken being very dry and hard. I couldn't even chew parts of it. I wasn't particularly fond of the sushi rice either. 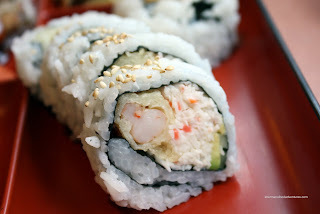 The dynamite roll looked good and was actually properly prepared except the rice was mushy and gummy. It wasn't all bad news, the tempura was very good. The batter was light and crispy and the veggies were perfectly cooked. To be fair, I am comparing the food here to some of the best Japanese food I've had. It wasn't really all that good; yet if you are in the area, it's inexpensive and edible. Once again, it's expectations based on location. eek, the tuna sashimi looks suspect. something about that colour. 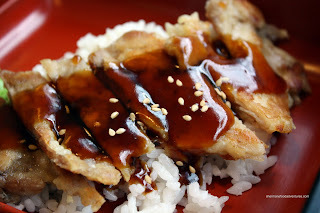 too bad about the teriyaki too... what a shame. however i like their menu, i want to try the hot night roll. Yah, the tuna was no good. Yah, the good ain't great, but it's edible.